This is my cute rustic shed in the suburbs. 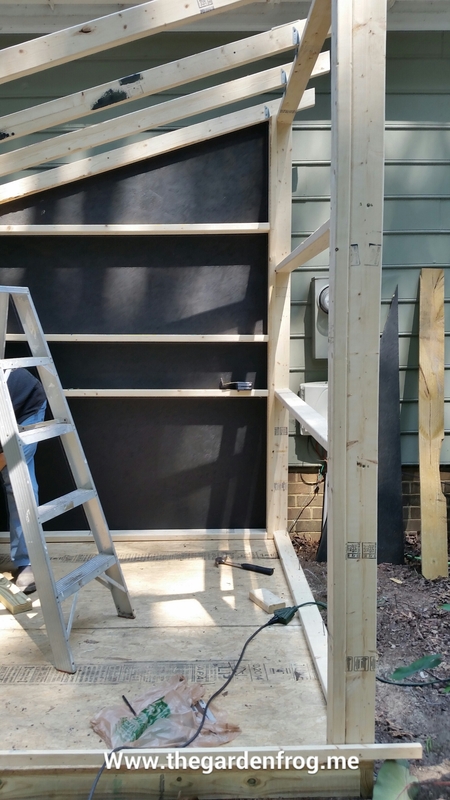 It is my secret shed because in my subdivision the sheds are supposed to look like the house, be placed where the HOA says you can put it, and it is preferred to be designed and built by professionals. 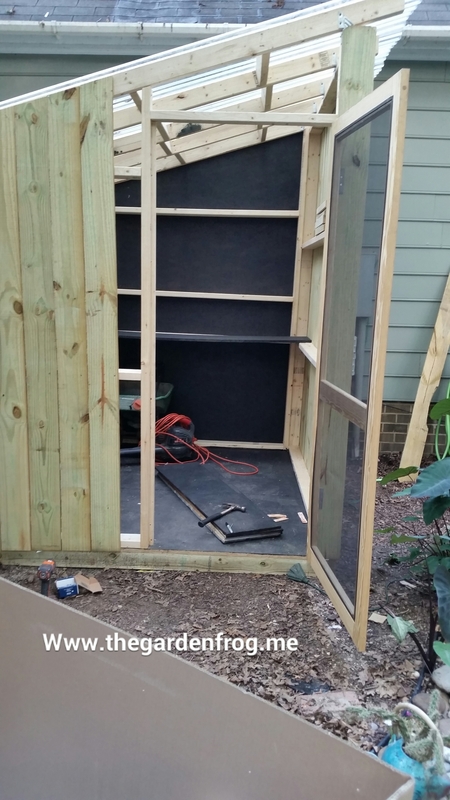 A shed would have to built in the back yard and where my HOA would tell me to put it…well, I have a pond, beds of flowers, trees, and shrubs, and the biggest reason — I would see a shed from my window and not my beautiful plants. I have wanted-no needed- a shed for a long time. Our 1 car garage is supposed to be our workshop but it also had to house the lawnmower, power washer, my projects, and other various items that belong in a shed. The garage was a HOT MESS and I could not take it any longer. 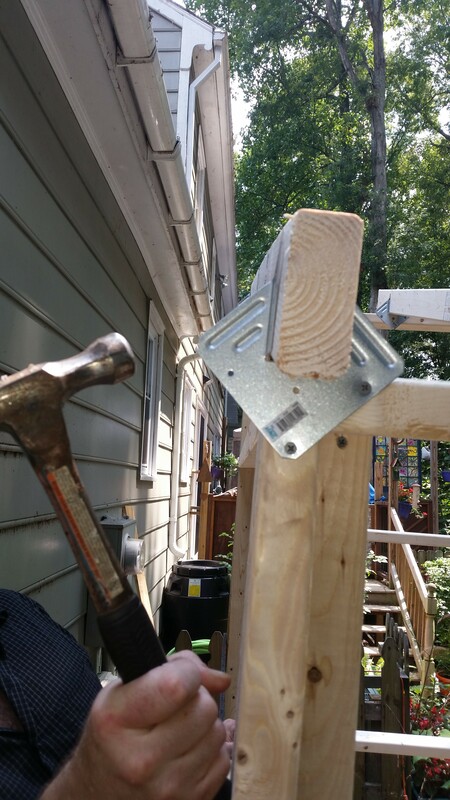 I had to convince my hubby of the fence picket idea but when I dragged him to Home Depot last weekend to see the 6′ & 8′ fence pickets and show him my vision. It helped that I showed him the sheds in the parking lot were not built any different than my plans. He agreed to help me and I was so excited. I know this but we are DIYers with a vision…at least I had the vision. I also wanted a project with minimal cutting and easy for most DIYers to do. 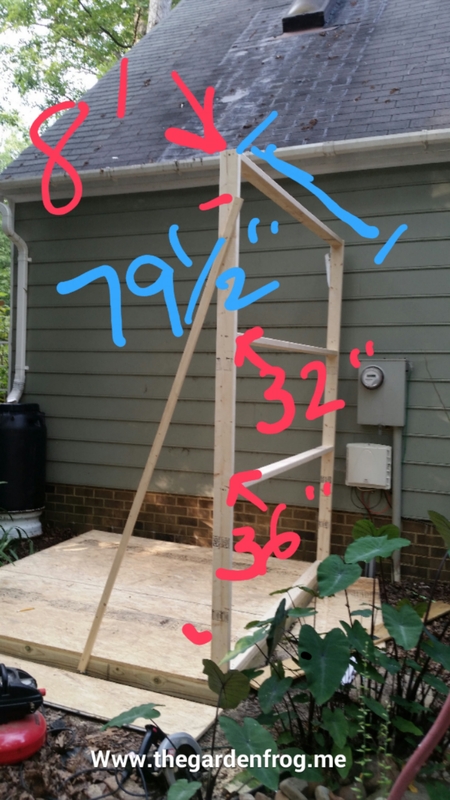 I will try to be descriptive on the plans and some of the pics have measurements for the size that would fit in our space plus that would enable us to use 8′ 2x4s for the roof at a 15 degree angle. 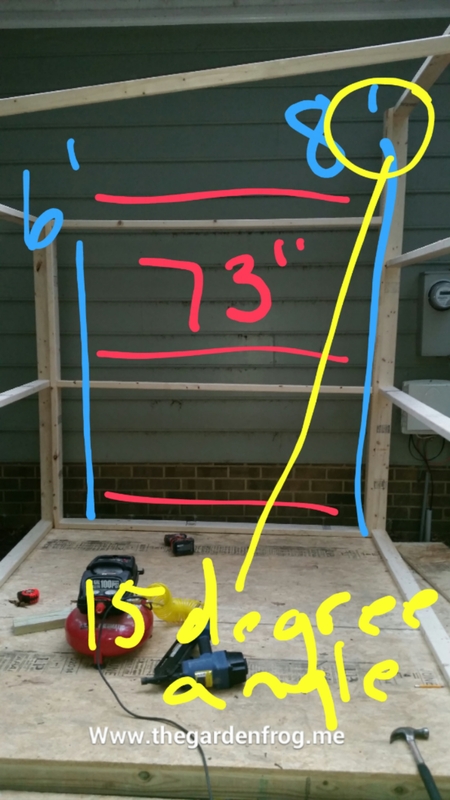 that was the angle for using 6′ pickets on one side and 8′ pickets on the other. 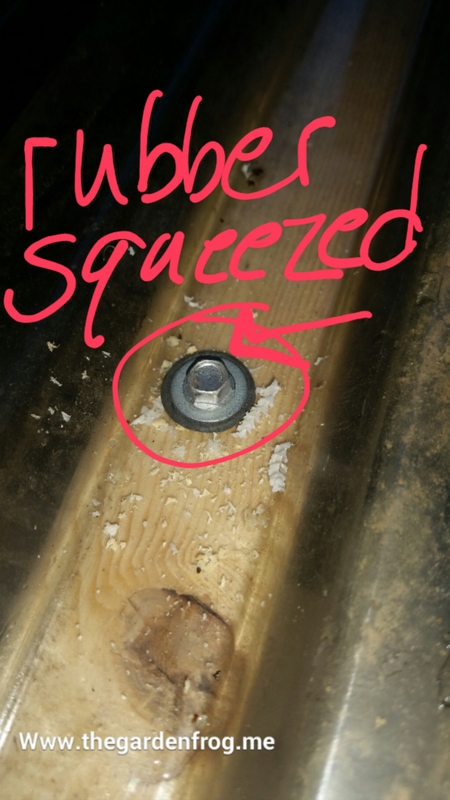 We used our air compressor with nail gun and 3″ screws since we happened to have both on hand. 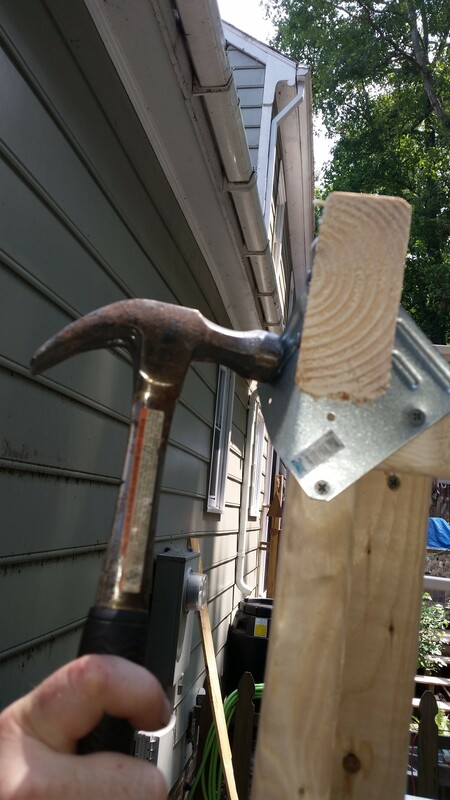 I like using screws because if there is a problem, all you have to do is take the screw out. 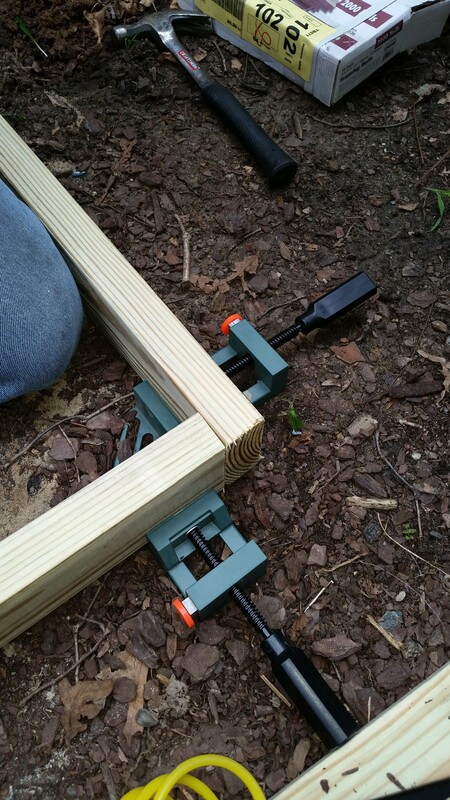 Using a level and a square comes in handy so that you can level the base. 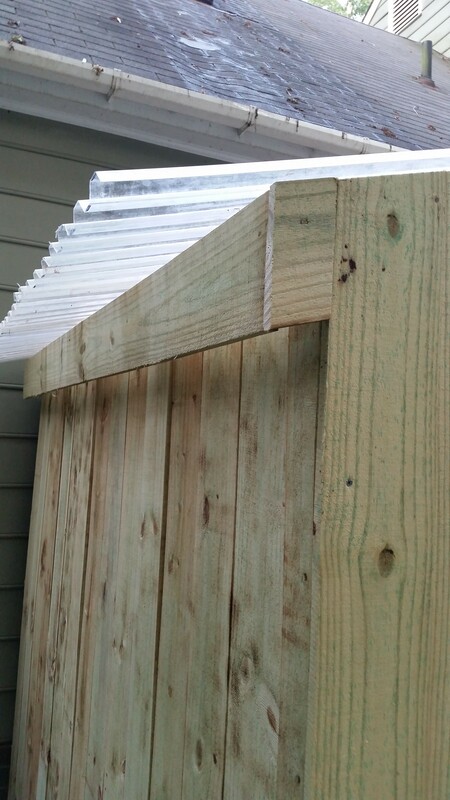 We had 5 sheets of corrugated roofing and 4 were used for roof and 1 for the door. 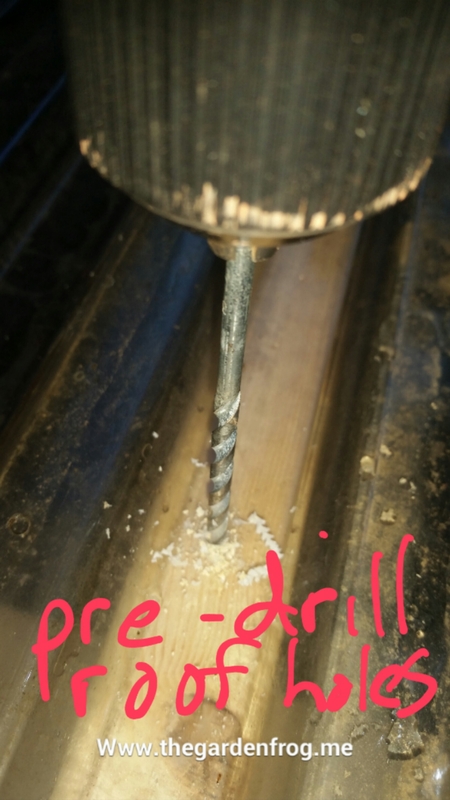 To use the corrugated roofing we had to buy special screws with rubber washers to seal and used a masonry bit to pre-drill the holes A(which later we found out a titanium bit worked just fine). You also need tin snips to cut the roofing material. 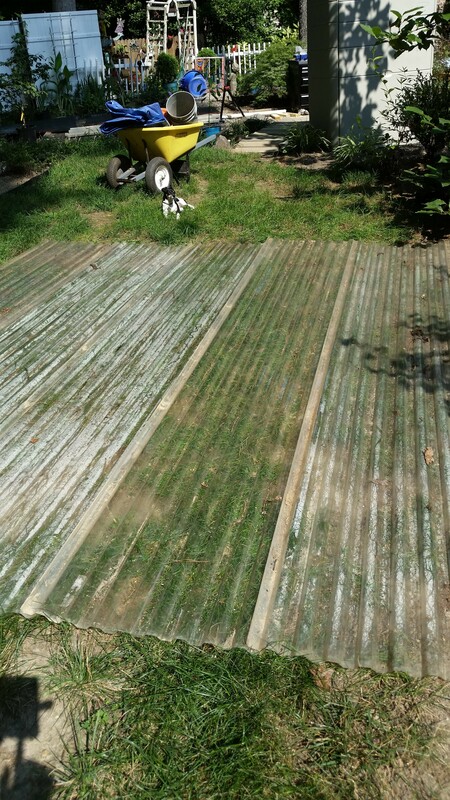 Corrugated roofing comes in clear or tinted and I would definitely use tinted if I every do this again. It gets a bit hot in the shed but it is well lit! 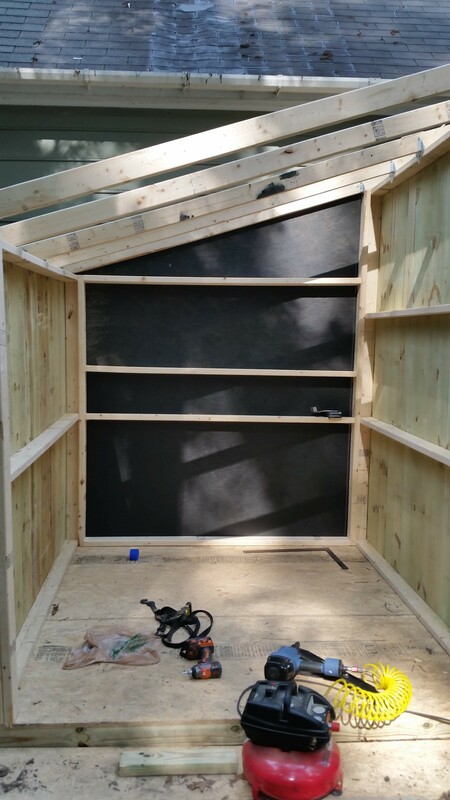 I hope the directions are easy to follow and that this inspires you to build your very own rustic shed. We bought this handy dandy corner tool to make sure corners were square. 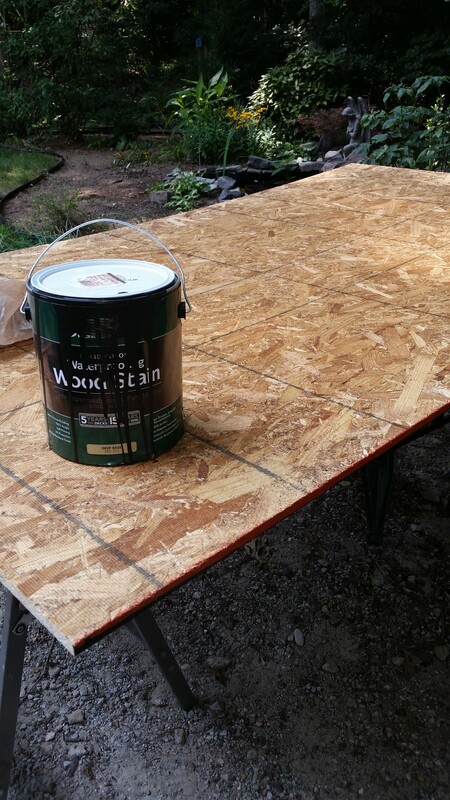 After we built the frame for the floor, we laid the 4×8 sheet on the base and cut it. 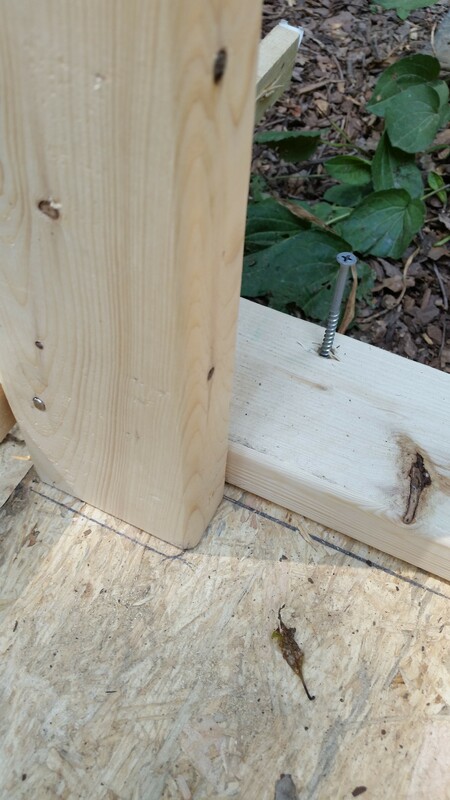 We find it is easier to measure and cut it on the frame and then attach with nails using our nail gun. 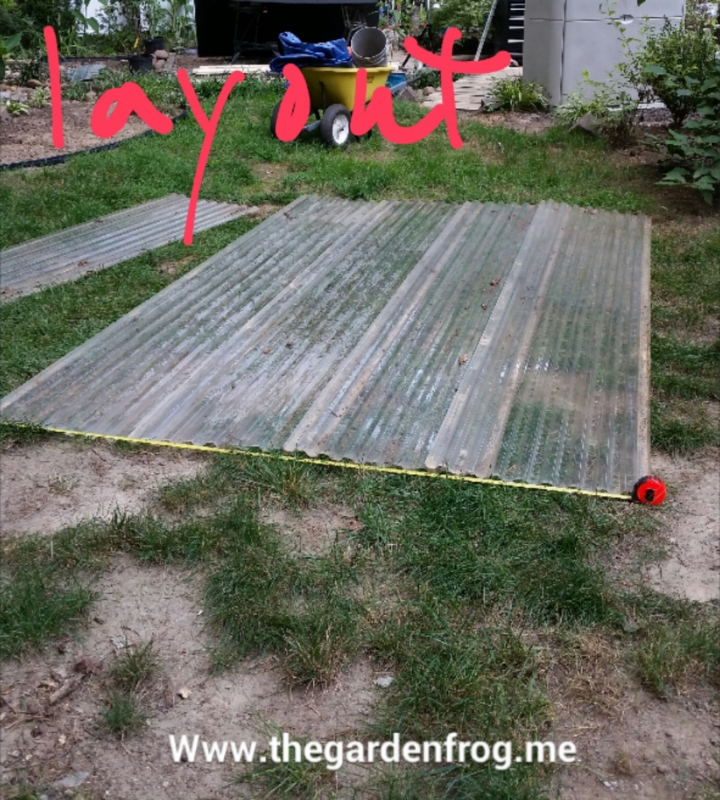 We are not carpenters -so we laid out the roofing panels and overlapped them to get the right width for the shed. 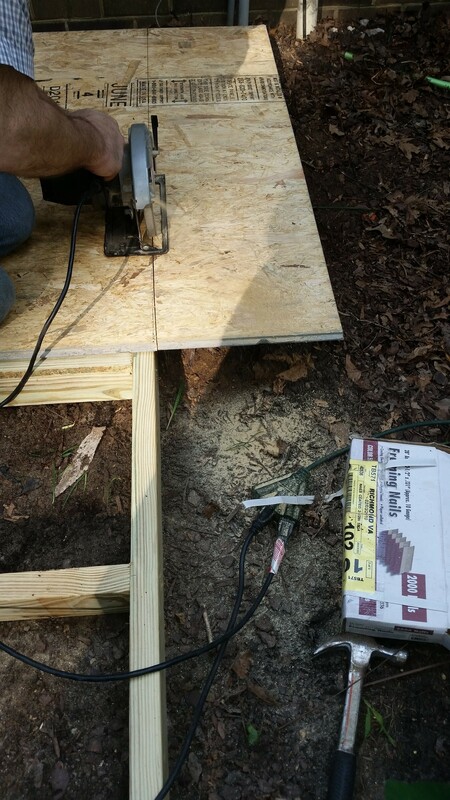 We then put the joists where we could attach the downward groove to the roof joist. 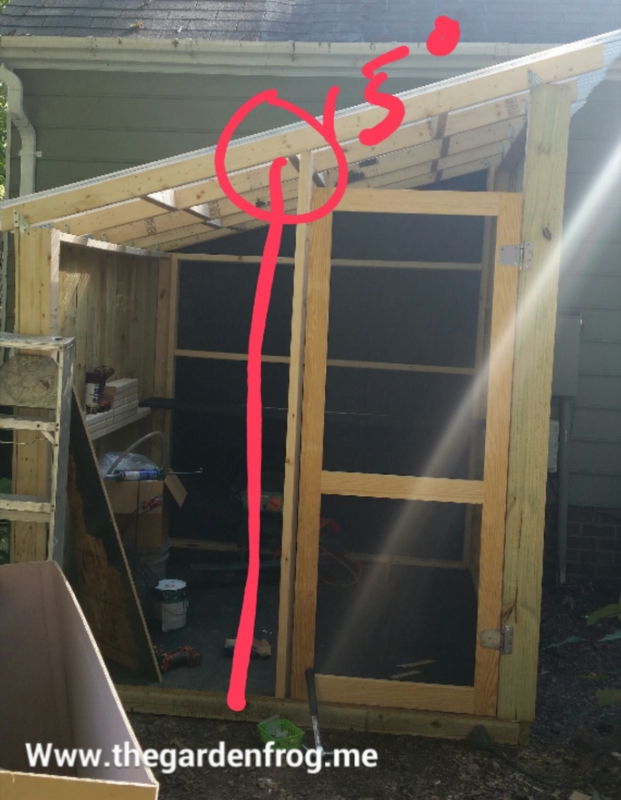 This is close to the measure of the shed frame. 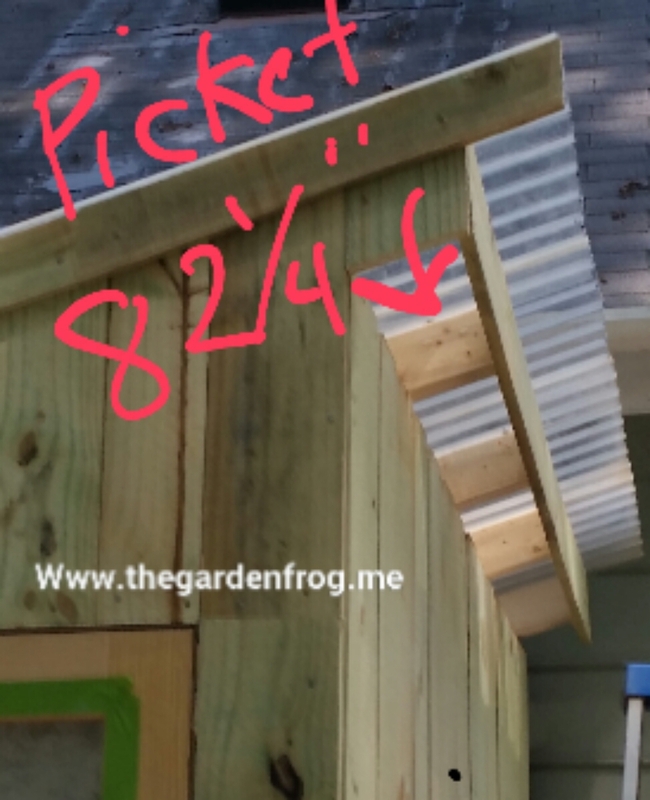 There is one groove overlap for front and back which is perfect so the water flows over roof. 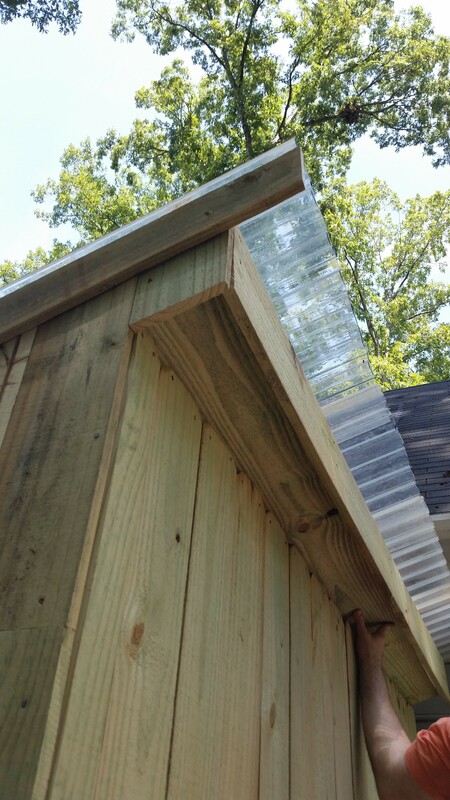 The ends of the corrugated roofing are down and we screwed the downward grooves (not sure if this is right but it works). Repeated for the 8′ side. this bugged me. 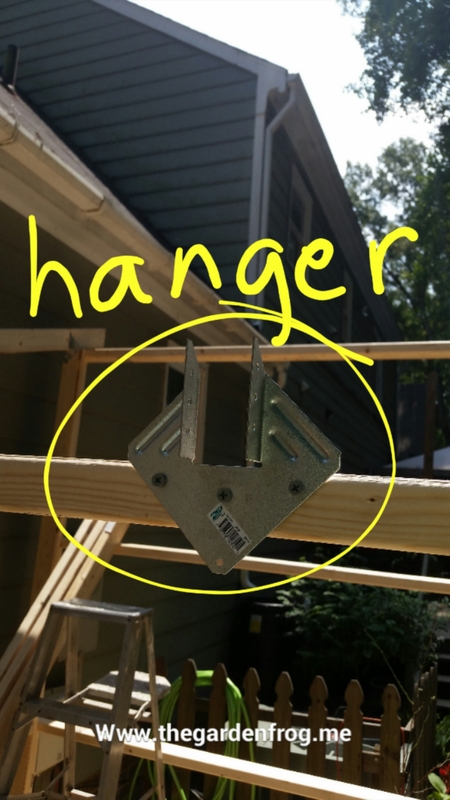 I did not like seeing this on the 8′ side after I had repeated the picket on the outside edges of joists. 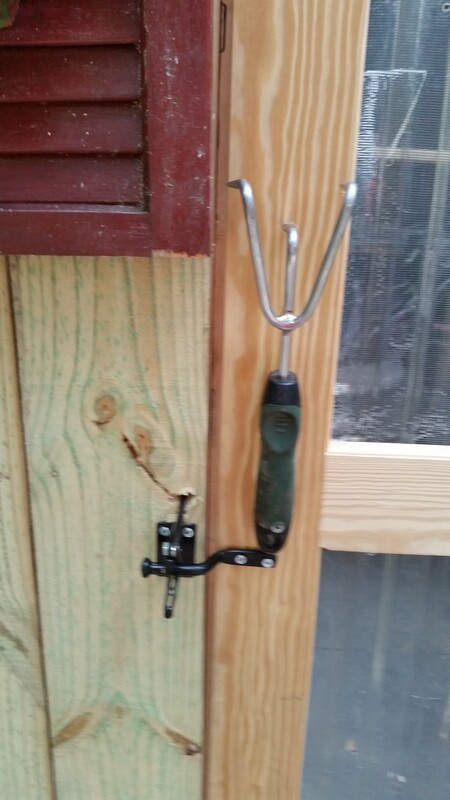 I made a handle from a cheap garden tool which I will post the easy how to in another blog. 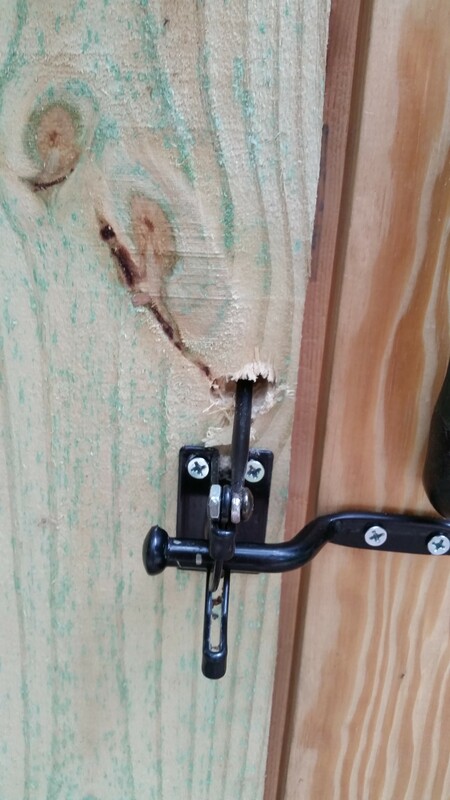 I had my hubby modified the gate latch because I realized that if the door shuts on you in the shed then you are stuck. So hubby came up with a modification that whomever can pull the special release and get out. He is brilliant! If the door shuts, no worries because you pull this hook and you are freed. The shutters were in the neighbor’s garbage and I cut in half. Window was under deck just waiting for a place to hang. I quickly made the window box from very old oak boards I got from a trip to the back hills of Kentucky a few years ago. I painted the signs and hung our lucky horseshoe. On the back of the screen the extra piece of corrugated roofing is screwed on to keep weather out. Absolutely beautiful!!!! 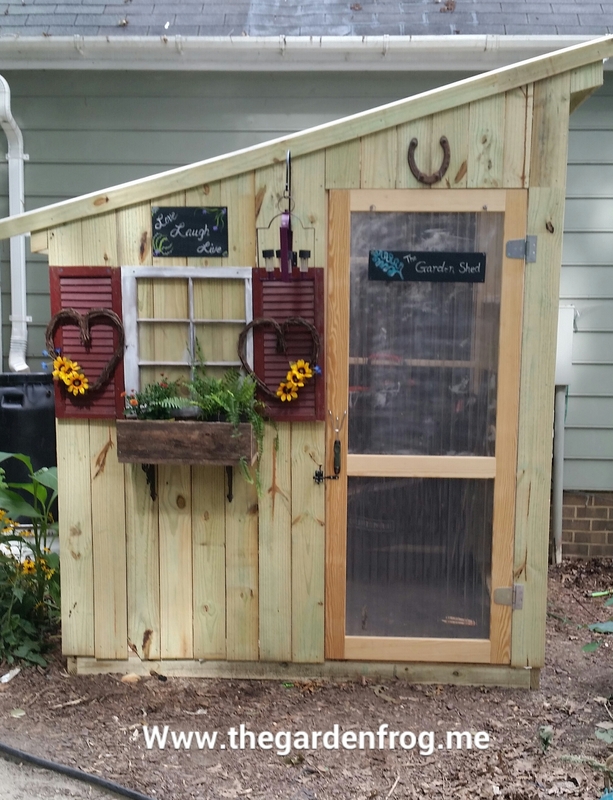 I have been researching garden sheds for the fast few days as our one car garage is also filled with yard/garden tools and I came across your shed on the Hometalk Facebook page. This is exactly what I need and I believe I can make this one myself (well, mainly by myself). Thank you for your instructions and material list as well!!!!! I am so glad I could inspire you! Have fun! thank you for stopping by. I love my garden shed! 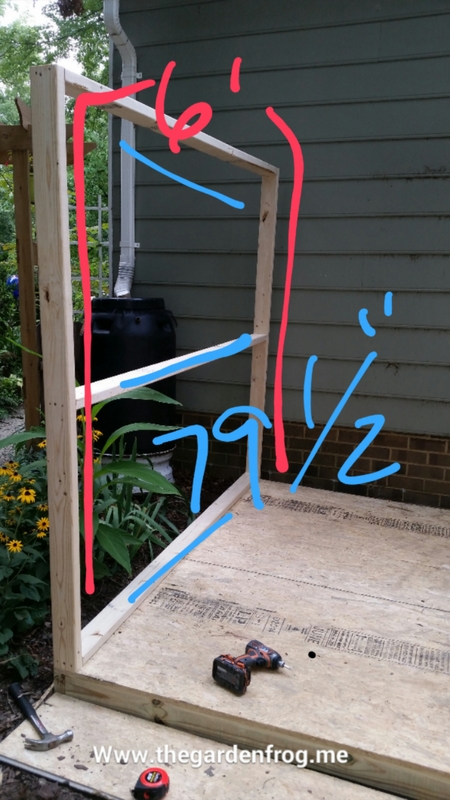 Could you explain more why you had to cut the 8ft side at a 15% angle? I love your shed and I might just make my own! Thanks for the post! 15 degree angle is for the roof. 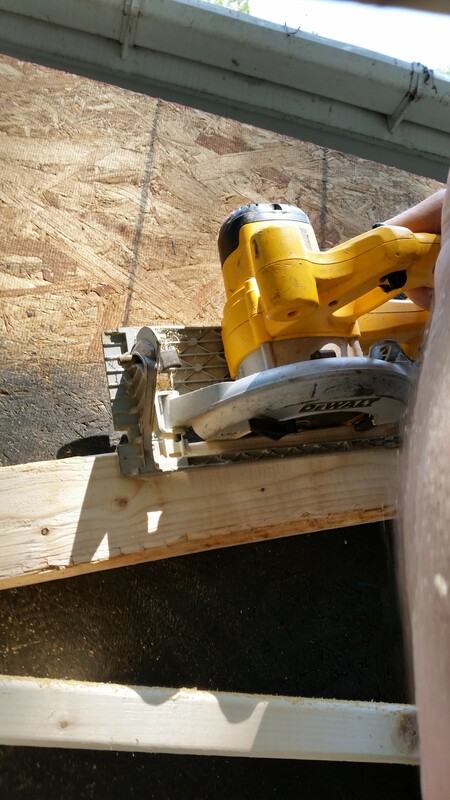 You cut the 8foot side so the slope meets the 6foot slant. 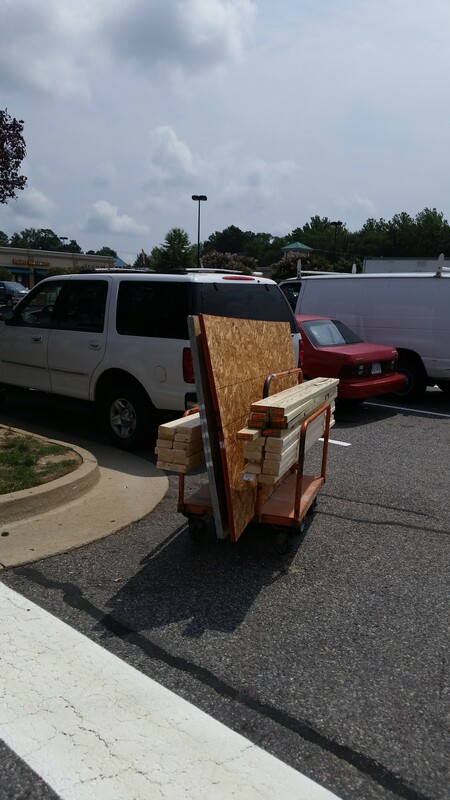 Oh also I wondered the 2×4 you purchased for framing, were they 2x4x8ft did you end up having them all cut specific sizes? 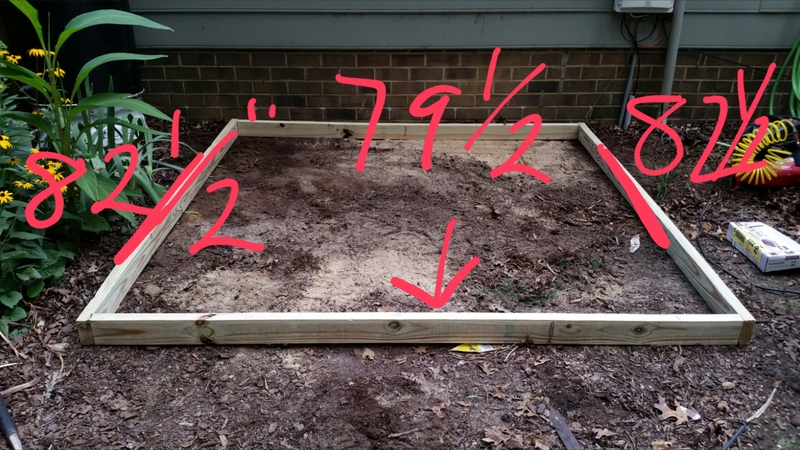 in each pic I have the measurements of what each 2×4 should be in the section as we built it. I tried to make minimal cuts and most measurements are the same for ease of building. 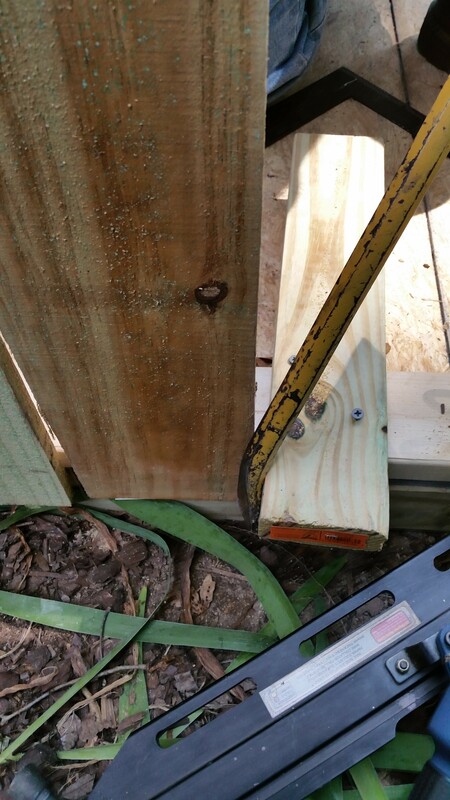 the 8foot studs had only a 15degree angle and the 6foot sides were cut at 6foot. so that was only 2. the pics should give you the measurements. 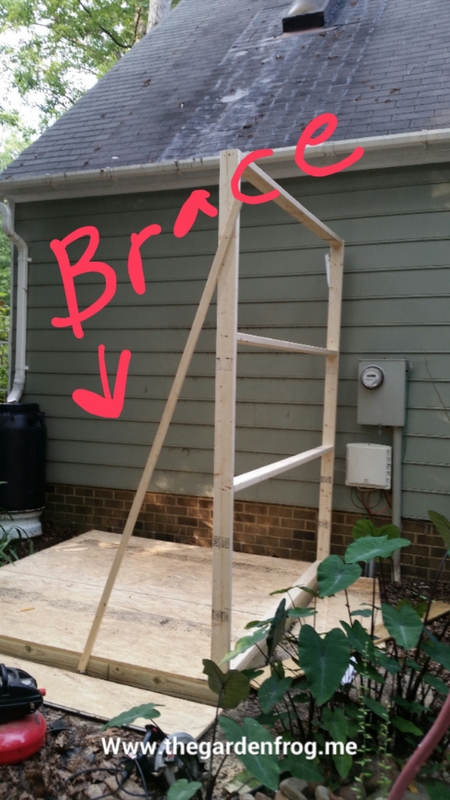 I am going to try and make the shed this summer. How creative and cute! the picture and all the instructions .Very cute ,just what I need!Good job guys! 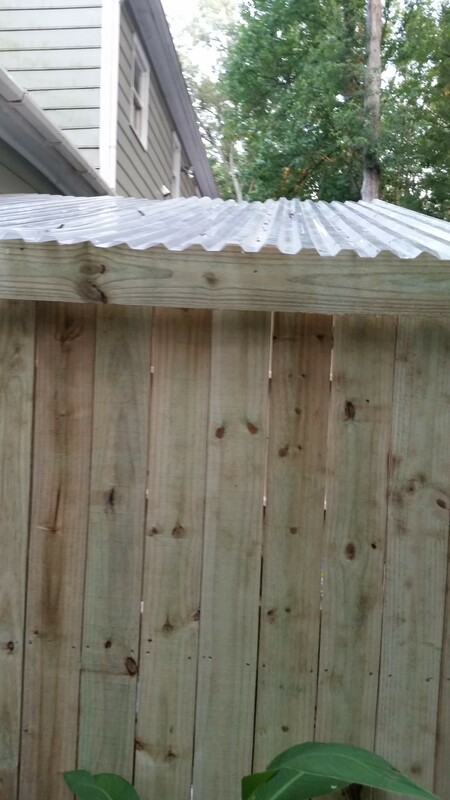 The house we bought recently already has the frame but has wooden lattice as the roof and walls. We’ve been trying to decide what we should do to as the lattice is sagging and ugly, when I found your shed I was euphoric!!! Thank you, we will copy your finishing details and replace the lattice with your recommendations!! You have made my day!!! 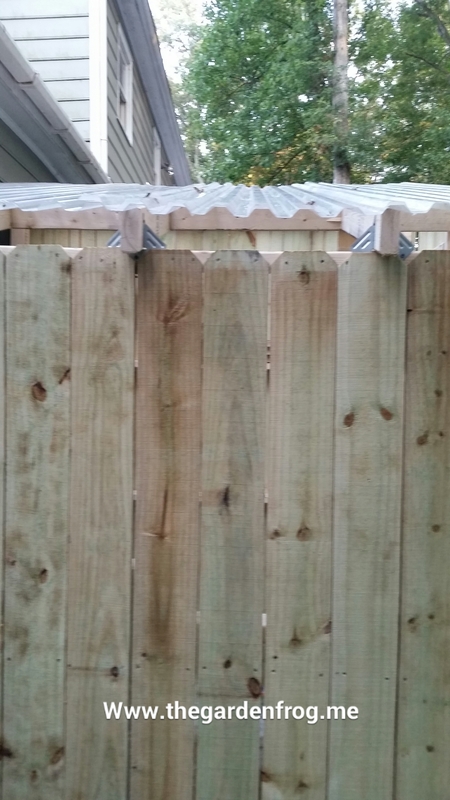 Just remember to let the fence pickets dry for week or so in the sun to dry out (an shrink). Goodluck! Wow, that came out fantastic! How cute. And handy. 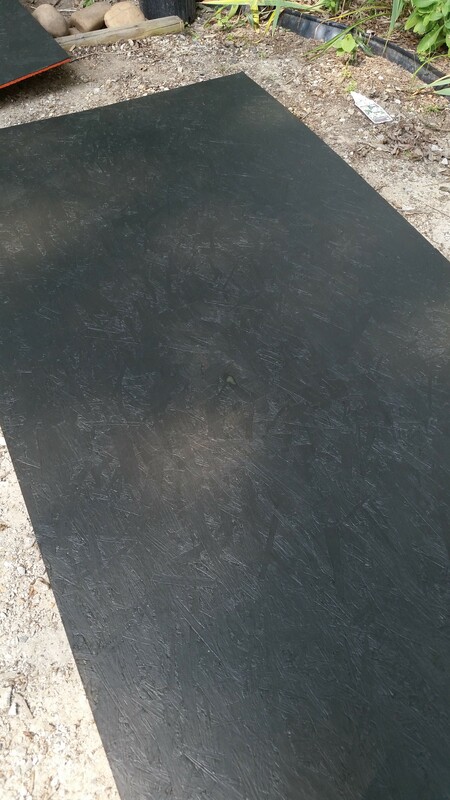 I just had a thought regarding your roof/heat dilemma – purchase the tinted rolled roofing and plop it right on top of the clear panels, or just find some shade cloth fabric and drape it (in a cute sort of way) over the roof during the hottest part of the season. Have fun with your new garden addition. I love the look. 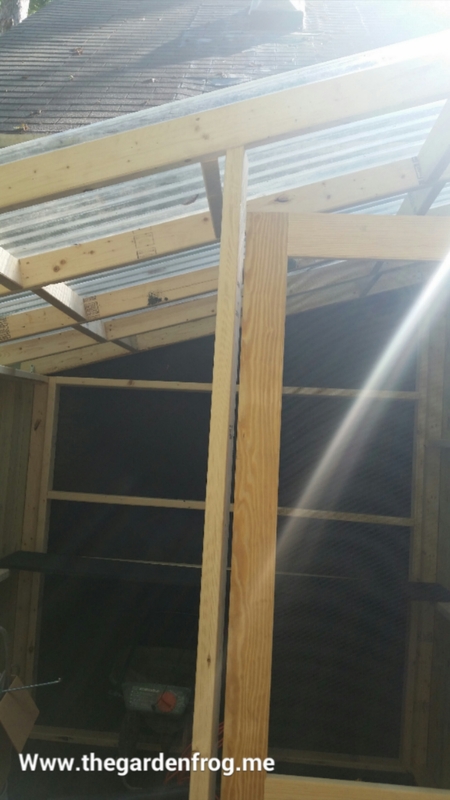 Boyfriend and I are going to take this, modify the measurments, and turn it into a chicken coop! Love it! Great! Thank you for stopping by! 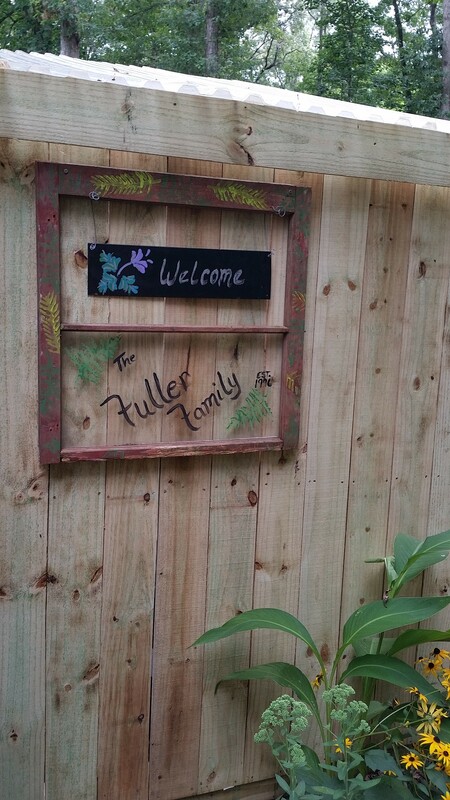 Well it is simple and i love it.Just thinking i could do this with pallets. And as far as the HOA i understand they want order but when i pay my own taxes and insurance I don,t think i want someone else telling me what and where i can put things in my yard. I just don,t roll like that. With that said ,it would make a great mini greenhouse. This garden shed is absolutely brilliant!! Adorable, yet affordable. Easy, yet strong. I’m thinking of adapting your plan to build a playhouse for my gran daughters! They would love this! I’ll probably add a window or two also. 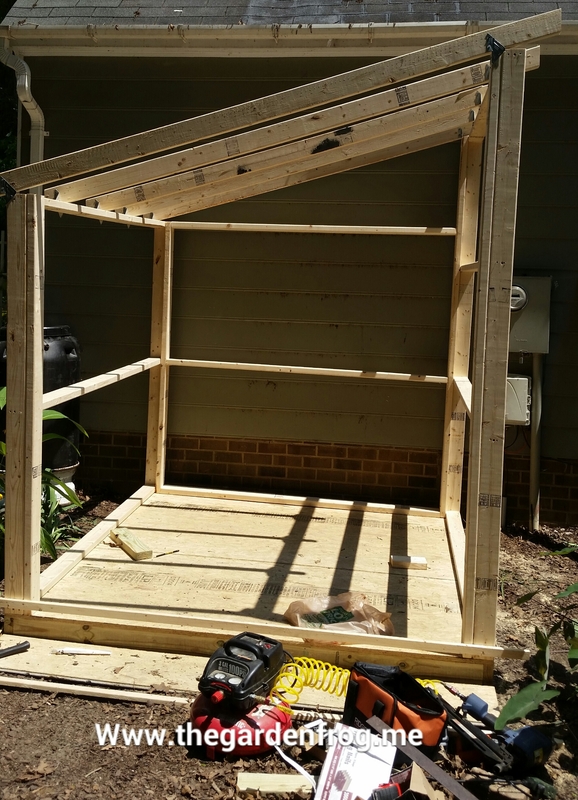 Or…….maybe I’ll just make a “She Shed” just for me! Thanks for the great instructions! 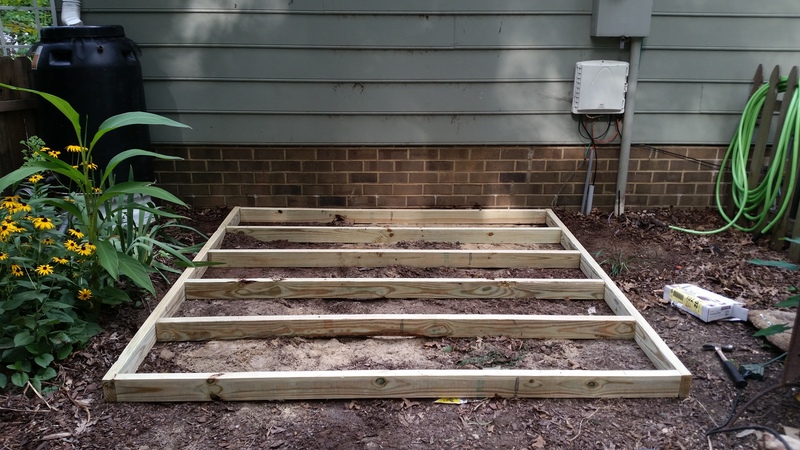 For not being “carpenters” you and your hubbie did a fantastic job! 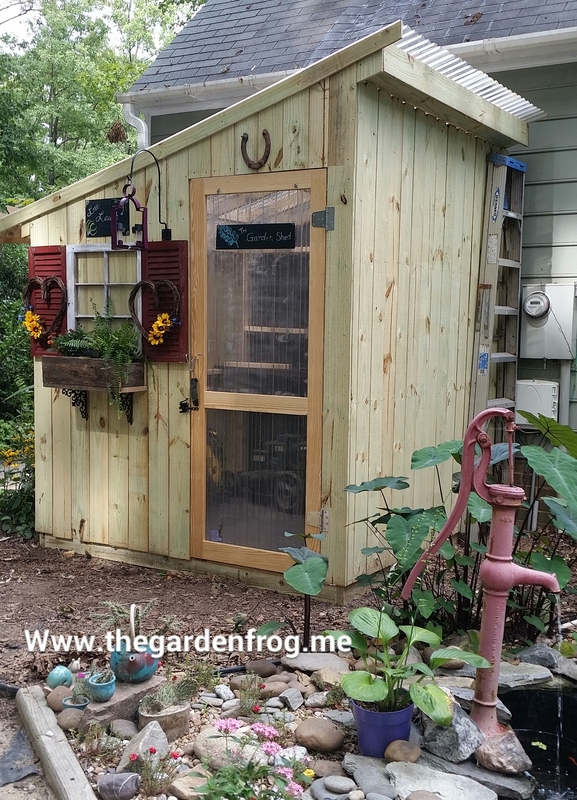 thank you for featuring my rustic garden shed! Garden frog, I absolutely love you and your hubby! You both inspire me. 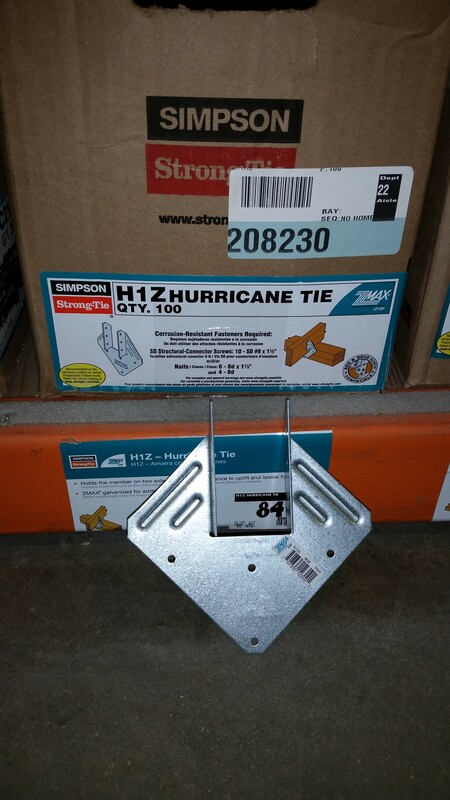 Thank you for sharing your DIY. I’ve been searching for a shed and just cannot come up with the cash for what they are asking for. Your shed is amazing! Hoping my hubby will get on board. Thank you. Lesson learned fir me: but pickets and remember they will shrink when new. Have fun! Cute. But I don’t know how a person (or two) could possibly build this using your directions here. Do you have a printable version with a cut list and step by step instructions? I am working on a printable version. I am not tech savvy so it will take me some time. I w ould like something like this over my well. 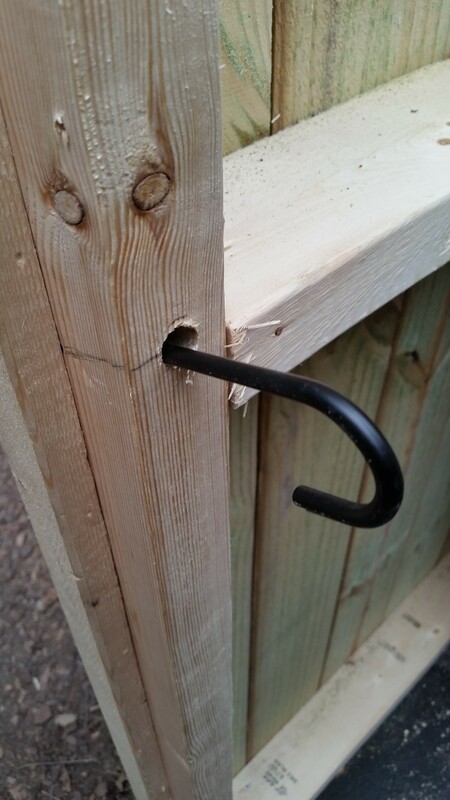 Is there a handyman that does this? Love, love this shed! My boys & I are planning on building a similar version in February 2017, I can’t wait! 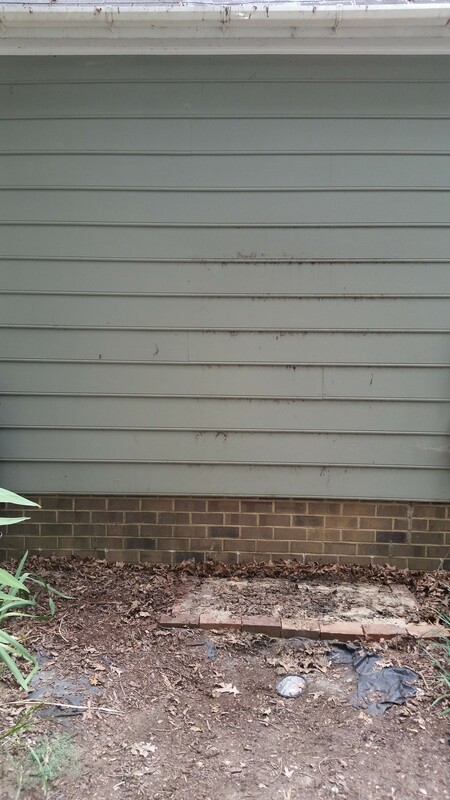 One question though, what did you use to seal the cracks on the fence panel? Or did you leave as is? 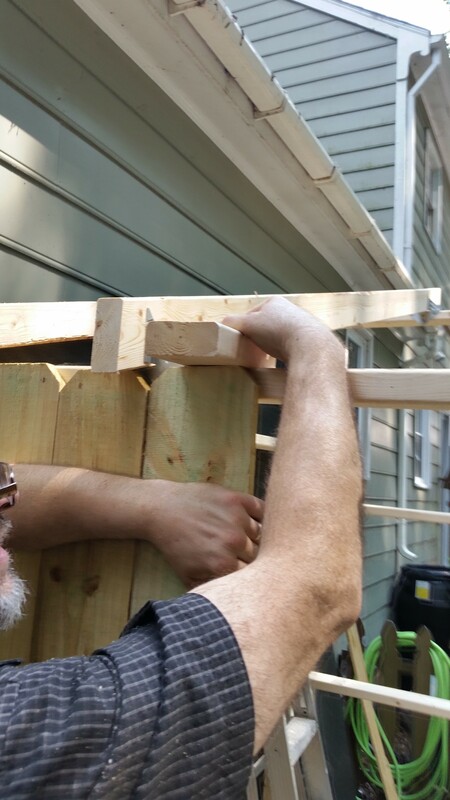 I did not use anything but you could use the board and batten idea which is to put a 1×2 furring strip on top of each gap. Or what I am going to make sure next time- buy the pickets and let sit in sun to dry for a couple weeks. Have fun! and thanks for checking it out! This is exactly what I was looking for to store my gardening tools and some of the kids water toys for our pond. I needed something useful, but cute and I like the price tag! Thank you! I love creating and sharing. 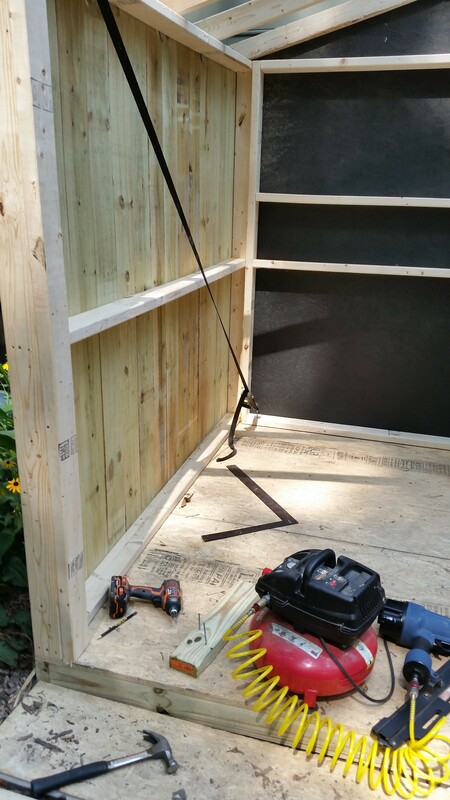 Have fun creating your own picket shed! Oh my goodness! I LOVE it! I know all about HOA rules and you definitely found a way to get what you wanted and make it adorable as well as useful. 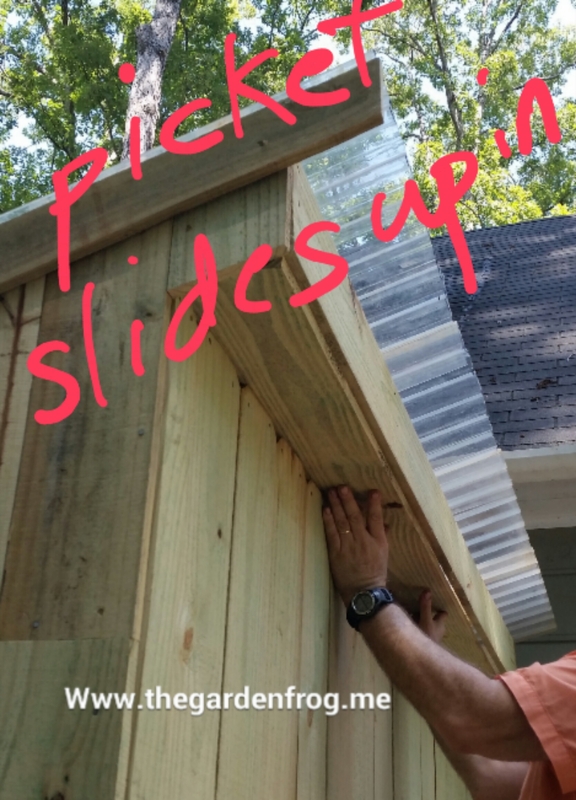 What a great idea and your outline of the steps is so handy! Sharing!!!! Thank you! Moving out of a HOA soon so I will build another! i’m nominating you for a unique blogger award!